Jihad against Yoga. Muslim Yoga teacher Rafia Naaz’s house attacked in Ranchi by Islamists. Branded as a ‘stooge of Hindu Kaffirs’, young Muslim Yoga teacher Rafia Naaz threatened by Maulanas and her house attacked in Ranchi by fanatic Islamist hooligans. Preeti Jalan | HENB | Ranchi | Nov 10, 2017:: As if an ‘alleged’ fatwa+ was not enough, a group of Islamist hooligans today created ruckus outside the residence of a Muslim Yoga teacher from Jharkhand. Rafia Naaz, against whom a fatwa was issued by an extremist faction as believed, while she was giving live interview to various media houses. As per India Today+, the ruckus was triggered after a cleric from the locality watched the live telecast. The cleric who allegedly got offended by the interview soon came with an angry mob to Rafia’s residence. An irate mob gathered outside Rafia’s house resorted to stone pelting and sloganeering. The cleric said that during Rafia’s interview an objectionable remark was made against him. As per Zee News reporting+, some unidentified persons on Friday hurled stones at the house of Rafia Naaz – a Muslim girl who is facing the ire of her community members for teaching yoga in Jharkhand’s Ranchi. 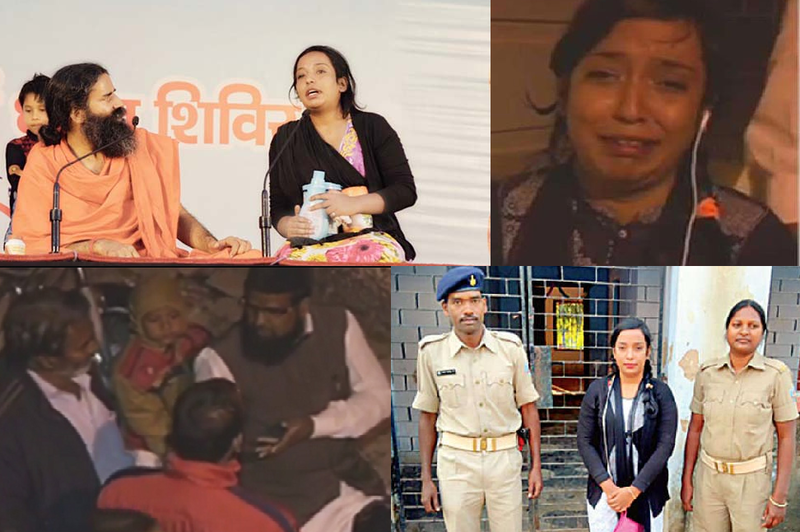 The shocking incident occurred while Rafia Naaz was sharing her views with Zee Media on the fatwa issued against her by the members of her community recently. Some members of the community gathered outside her house in Ranchi and hurled stones, which further petrified the young girl while was live on Zee Media and sharing how she was being targeted for teaching yoga. It’s shocking that the Jharkhand Police yet not arrested anybody in connection with the attack on the house of the Muslim Yoga Teacher in the Doranda locality (Hatia area) of Ranchi, even after the attackers were seen in the available live video coverage from many sources. Meanwhile, noted yoga guru Ramdev has now come out in support of Rafia. She rose to fame after she shared the stage with yoga guru Ramdev in the city sometimes back. ”Religion shouldn’t be brought into this,” Ramdev said while reacting to reports of stones being hurled at Rafia Naaz’s house in Ranchi. It is also reported that in a ‘Jihad against Yoga’, the attackers on Rafia Naaz’s house were shouting slogans against Yoga, Baba Ramdev, Rafia with filthy languages and they were trolling Rafia as a ‘Stooge of Hindu Kafirs’. The arrogant Muslims gathered in front of Rafia’s house were raising slogans, “हिन्दू काफिरों को परिंदा रफ़ीआ मुर्दाबाद।”; “मुस्लिम पर योग थोपनेवाला रामदेव मुर्दाबाद।” — Stooge of Hindu Kaffirs, Rafia Go to hell; Yoga propagator in Muslims, Ramdev go to hell… etc. __Inputs from Zee News, India Today and Times Now. where is the secular brigade, can’t they see this victim muslim yog teacher? The inaction of police is regretted. Actually it is extremely admirable that Rafia has taken a vow to continue with Yoga and Yoga teaching !!! Now it is the obligation of local community – First- Sensible Muslims in the area should come forward and then other non Muslims should join them so that mischievous elements cannot give it a communal color. Better still, keep the administration informed of the action planned. Bottom line, it is our obligation to give courage and encouragement to individuals like Rafia Naaz so they can show Fatwa commanders the right path. Hindus there are a bunch of cowards.. go protect her and give her Bhagavad Gita. Get the police to arrest these muslims. they always cause problems wherever they go.. get them sent to jail! go file FIR .. do it! She, and others like her, should just leave Islam. That’s not just the best solution, but increasingly, the only solution. This entry was posted on November 11, 2017 by hinduexistence in Anti Women, Anti-Hindu, Anti-Indian, Islamic Conspiracy Against Peace and Humanity, Islamic Conspiracy Against Women, Islamic Menace, Jihad against Yoga, Jihad in Jharkhand and tagged Jihad against Yoga, Rafia -Branded as a 'stooge of Hindu Kaffirs', Rafia Naaz - Yog Guru Ramdev connection, Rafia's house attacked in Ranchi by fanatic Islamist, Yog Teacher Rafia Naaz's house attacked in Ranchi, Yoga teacher Rafia Naaz threatened by Maulanas, Yoga teacher Rafia Naaz's house attacked in Ranchi by Islamists.